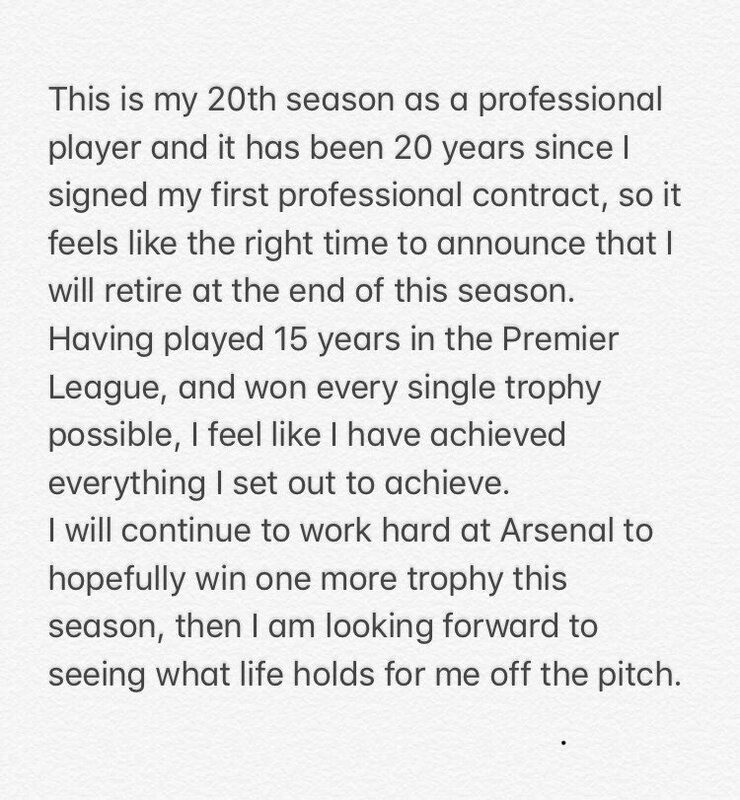 "This is my 20th season as a professional player and it has been 20 years since I signed my first professional contract, so it feels like the right time to announce that I will retire at the end of this season. Having played 15 years in the Premier League, and won every single trophy possible, I feel like I have achieved everything I set out to achieve. I will continue to work hard at Arsenal to hopefully win one more trophy this season, then I am looking forward to seeing what life holds for me off the pitch." Goalkeeper Petr Cech will be sidelined for up to a month with a hamstring injury, Arsenal have announced. Cech was replaced early in the second half of Saturday's Premier League match against Watford, with Bernd Leno coming on to keep a clean sheet as the Gunners won 2-0. Arsenal said in an injury update on their official website ahead of the Europa League tie away to Qarabag in Baku on Thursday that Cech had a "left hamstring injury" and was "expected to return to full training in three to four weeks". He has kept summer signing Bernd Leno on the bench - except for Thursday's Europa League win over Vorskla Poltava - and Emery is pleased with his goalkeeping options. "Petr has big experience and big quality. He's started the season very well and we think he's giving us the performance we want. Today he showed us that he's very good and continuing to work hard with this spirit every day." Arsenal's Petr Cech believes if his side were to win the Europa League it would be a sign of progression for the club. Petr Cech has moved to ease the tensions with Arsenal's fanbase by suggesting he understands their frustrations. Petr Cech insists missing one year of the Champions League is not a problem but says Arsenal must keep their star players. Petr Cech believes Arsenal have disproved accusations they lack leaders by beating Manchester City and reaching the FA Cup final. However, Cech has warned his team-mates winning the FA Cup for a third time in four years would still not excuse them failing to qualify for next season's Champions League. Arsenal will face Chelsea in the final at Wembley on May 27 after goals from Nacho Monreal and Alexis Sanchez sealed a 2-1 win in extra-time against City, who had earlier led through Sergio Aguero. I think it's easy to hide behind 'oh they lack leaders but they have leaders'. You need to see behind the scenes how well the team works and how we operate. Sometimes you have periods of games where you prepare and do the right things but the game starts and it goes completely wrong. We had a difficult period where the team was losing games it should have not lost and obviously you come to the situation where you play under pressure and need to find a way out. Sometimes you find a way out quickly and sometimes it takes a bit of time. There is no other option than we need to keep getting three points in every game to hope we can get automatic qualification for the Champions League for next season. Petr Cech says Arsenal's thumping 5-1 win at West Ham proved they can handle the pressure in the title race. "It became a kind of must-win game for us when Chelsea won and obviously the gap opened to six points," goalkeeper Cech told the club website. "We knew what we had to do and we did it in a very professional way, so we are happy. "We a lot of opportunities in the first half but it wouldn't go in. In the second half at 1-0 their keeper made some fantastic saves and you think it could still be a dangerous scoreline. "I know a lot of people would have been a bit anxious, but we showed the maturity not to panic and we kept going. We thoroughly deserved the goals for our performance."